When you are looking for a hand mixer, you want a device that will make mixing not only quicker and more effective, but one that is also easier to handle and offers a more diverse range of use options. The new MultiMix 3 from Braun with a unique ergonomic design is the answer: The perfect match for perfect results. 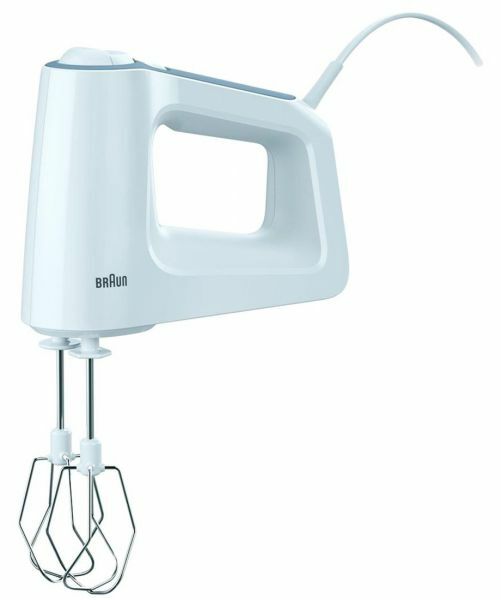 All of these powerful, compact hand mixers from basic to top of the range feature a unique ergonomic design that guarantees a perfect match for all attachments to ensure ultimate convenience and a maximum of effort when mixing for any baking need delivering perfect results that bring out your own baking style. By placing the motor directly over the attachments, the weight is directed into the bowl, not in your hand. Conveniently switch whisking and mixing tools just one press of the large button. Adjust the speed dial from low to turbo with a flick of the thumb for better control and efficiency in preparing food. While resting your hand mixer or in use, the cord conveniently stays away from your hand. Non-slip handle ensures a steady, cushy and secure grip even at the highest speed. Whips, beats and stirs easily eggs and cream, mixes cakes, muffins and home-made desserts. The dough hooks are perfectly suited for kneading, making shortbreads and pastries.